The Housing Recovery Is Officially Here—What Happens Next? Whoever wins November's election is going to go into 2013 with the mother of all tailwinds: The U.S. real estate industry is officially in recovery mode. Is the latest improvement in unemployment a statistical fluke, a political conspiracy or the start of something real? The answer, obvious to anyone paying attention to the US housing market, is that it's real. Just look at this morning's housing construction numbers--a 15% increase in September, the best performance in more than four years. Economic news will be saw-toothed through the winter, but the real estate industry is finally starting to create jobs, and will keep doing so in 2013, regardless of who becomes the next US president. No one at this point is even arguing that real estate has rebounded. Last February, Redfin was one of the first to call the bottom, at a time when others were still revising their 2012 forecasts downward. Now, Goldman Sachs predicts that home prices will increase 2% over the next 12 months, rising another 2.8% the year after that. JP Morgan CEO Jamie Dimon said on Friday that housing has turned the corner. Only 11% of consumers now expect home prices to decline. US banks have already benefited, both from increased mortgage applications and fewer real-estate-related write-downs, with the biggest two reporting record profits. The only questions now are whether it will last and what it means for the overall economy. On the ground and in national statistics across the board, we see ample evidence that prices recovered in 2012, and now expect that sales -- and jobs -- will follow suit. The reason real estate leads America in and out of recessions--of the 14 times American home prices have declined, 11 have resulted in a recession--is because it employs so many people in so many places, contributing as much as 18% of the gross domestic product. The US has more than 1 million licensed real estate agents but less than half that have recently served a customer. The construction industry has lost roughly 2 million jobs in the past five years, mostly due to the real estate crash. Many of these folks struggle to find jobs in other industries. Because of trade deficits, electoral politics and nostalgia, we talk almost exclusively about the ebb and flow of manufacturing in Michigan and Ohio, but the auto industry's impressive recovery has only added 250,000 jobs. Even a modest increase in real estate jobs can swing the economy even further, reaching every corner of the country. Any town big enough to have a gas station and a pizza parlor usually has a real estate office, with plenty of empty desks. This is why an uptick in real estate sales has far-reaching effects. One of the first sectors to add jobs will be construction. The reason builders have had a great year in 2012 is because they've been able to build more without hiring more. Skeleton crews finishing off half-built projects--often bought for pennies on the dollar from bankrupt competitors--haven't added many jobs. It takes fewer cooks to prepare leftovers for dinner. But now the builders are hiring big teams to break ground on new projects; housing starts are up 29% over last year. The Federal Reserve just reported not only strengthening home sales, but more construction across most of the country. In almost every American city, there are more cranes in the sky and holes in the ground, and more jobs. So why has it taken so long for real estate to contribute to a recovery? Prices rose this spring due to demand, but sales lagged. And sales are what matter most, putting money in the pockets of brokers and builders. It's hard for sales to increase more than a few points when inventory is down 29% from last year. The Federal Reserve spurred demand with record-low interest rates, throwing a party for the real-estate industry that many sellers decided to skip. So when will sellers and buyers hook up? The truth is that there's always a lag. When real estate prices first start to move up, builders hesitate to build and sellers hesitate to sell. As in other cyclical industries, it takes most of a year just for everyone to believe it's real. 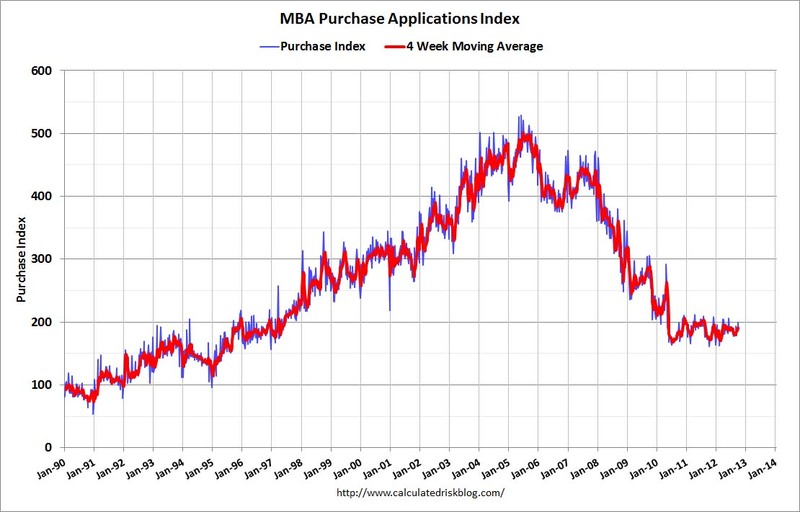 The first inflection point came in 2011, with stabilizing prices. Prior to that, banks were still the market-makers in most cities, controlling inventory levels and setting prices through sales of foreclosures. But then last fall, the number of foreclosures for sale began to drop steeply; few individual home-owners were willing to pick up the slack by listing their own home, especially at the prices set by the banks. Inventory fell so far so fast that we soon began to see bidding wars, and prices stabilized. Eventually rising prices will bring sellers back to the market. Every day this year, Redfin agents have been meeting regular people to discuss whether to list now or hold off in the hope of a higher price next year. Many, at our encouragement, have been holding off. If you think we're anywhere near the bottom, and you don't mind waiting, why sell now? The inventory crunch has been compounded by rising rents and falling interest rates. In most American cities you can easily find a renter willing to pay your monthly mortgage and then some. We believe the sellers will start to come out in greater numbers next year. Waiting for them will be hundreds of thousands of would-be US home-buyers, who are now headed toward the holidays frustrated at having failed to find a listing in 2012. We think of these buyers as a source of shadow demand, perhaps not of the same magnitude as the shadow inventory one held back by the banks but very large. Already in the shoulder season before Thanksgiving, we're seeing plenty of "domino listings," where one home-owner puts his house on the market and immediately gets a sale, emboldening his neighbor to follow suit. More significantly, 2013 will be the first year in the last seven that will begin with a broad consensus that home prices are rising. Inventory has already started to increase in at least one market, Phoenix, as higher prices there induce owners to sell. As more listings appear nationwide next January, more sales will follow. Another more subtle change is driving employment: the amount of money people are putting into the homes they buy and sell. Economists often talk about home prices in abstract terms, as if people were simply paying less in 2010 for the exact same asset that sold in 2005. But in fact, Americans stopped putting money into homes over the past six years. Hard-nosed buyers stopped falling in love with finishes, and just did the math on how much they were paying per square foot. And sellers took note. Banks selling off their foreclosures stopped mowing the lawn, much less renovating the kitchen. The value of American real estate plummeted in part because America itself just started to look shabbier. That's changing. Builders are trying to justify higher appraisals with expensive add-ons. In markets like Washington D.C. and Orange County, California, we see homeowners investing in a new kitchen or an extra bedroom and convincing themselves they'll recoup part of the cost next year in a sale. Investors are pouring $50,000 into a home so they can sell it for an extra $200,000. This means that carpenters, electricians, plumbers and builders are getting more work and staying off the dole. Employment will improve next year because more of these folks -- and more real estate agents, lenders, inspectors and appraisers too -- will have jobs. This doesn't mean real estate will grow to the proportions it had at the height of the Bush-era bubble, when it was two and a half times larger than it is today. But it does mean that things will get much better. In fact, it's why they already have. Glenn Kelman is the CEO of Redfin, a technology-powered real estate broker. Previously, he co-founded Plumtree Software, with a 2002 IPO.